The Quiltzette - News from Cortez Quilt Company - So Many Events! The Cowboy Gathering of the Four Corners is pleased to announce that Award-Winning Cowgirl Poet and Quilter Yvonne Hollenbeck will be at the Cortez Quilt Company on Friday, August 1 at 4:00 p.m. Yvonne will be sharing her poetry on quilting while showing samples of her collection of family quilts which spans six generations. This is a show you won’t want to miss! For more information go to Yvonne Hollenbeck or Cowboy Gathering of the Four Corners. Beat the summer heat . . . sign up today for a relaxing afternoon of sewing with friends. Light refreshments provided and the event is FREE! Call to put your name on the list today. Okay, we know it's hard to think about working with flannel in the middle of the summer, but the collection that arrived yesterday won't last long, so hurry in to get your fabric for that special winter project. Patriotism never goes out of style! Make a great quilt for your favorite service member or veteran using this new 2 1/2 inch strip pack. 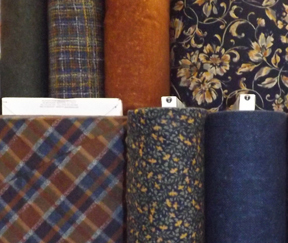 We also have several bolts of companion fabric in red and blue. This would make up nicely as one of the quick 1,600-inch strip quilts. 10:15 a.m. – 4 p.m.
Judy Bryan will teach this class, the first part of which will be choosing 19 different fabrics to make this beautiful quilt. You don’t need much of each fabric, so pull what you can from your stash and then supplement from the store shelves. We’ll make finding the perfect 19 a fun group effort! Then, learn to use the new Creative Grids Spider Web ruler. Accomplished long arm quilter Beth Cardozo will teach free motion quilting for us on August 2. Learn how to prepare your quilt, choose thread, select the right needle, and learn simple techniques that will take the mystery out of machine quilting. The book shown here is recommended but not required for the class. Bring 6-8 fat quarters with enough batting to sandwich those into 3-4 “quilts” to practice on. Solid colors or tone-on-tone will work best, along with contrasting thread so you can see your beautiful work. The raffle quilt for this year's show is currently on display at Cortez Quilt Company. Stop by to buy your tickets today. Can't you just imagine this beautiful king-sized quilt on a bed in your home? The tickets are $1/each or six for $5. The drawing will be held during the quilt show. You do not have to be present to win. The Applique Pressing Sheet is perfect for fusible applique designs and doubles as a pressing cloth. Coated with Polylon, the revolutionary non-stick surface, this double-sided sheet is made from an ultra high temperature fabric. Includes instructions for its multiple uses and a free applique pattern. The large 13 by 17 inch sheet is guaranteed for 5 years. Kwik Klip™ ends sore fingers, reduces basting time, and ends bunching. Using Kwik Klip™, safety pins close effortlessly, preventing broken nails, stuck fingers (blood on quilts) and the familiar painful indentations in fingers caused by closing hundreds of safety pins. 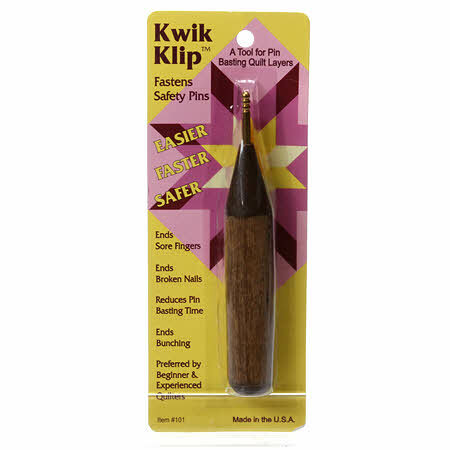 Kwik Klips'™ unique handle design helps those with arthritic hands pin baste without pain. With The Super Gripper's large finger holes you can easily and comfortably remove thread from stitches and seams, replace machine needles, or pull needles through thick fabric. It also allows you to clamp and hold fabric in place and it's great for turning. This tool will help you hold hard to handle items without them constantly slipping out of your hand. The Dolores Mountain Quilters guild is sponsoring a Red Dirt Retreat November 13-16 at the Hidden Oaks Lodge in the beautiful San Juan mountains. The cost is $325 for all four days and that price includes wonderful meals. For more information or to reserve your spot call Kate Nemanic at 970-882-1588 or e-mail her at katenemanic@yahoo.com.